If you were a kid in the New York City of the 1970s, Halloween probably resembled this. Your mom or dad bought you your costume in a store, and it came with a mask held to your head by a rubber band. Maybe you were the Bionic Woman, or a character from Planet of the Apes, or someone from Star Wars. Or you dressed up as a more classic Halloween character, like Batman or Cinderella or a witch or a skeleton. You didn’t go to the Halloween parade in Greenwich Village because you had never heard of it. You went trick or treating in your building or on your block after school, and most likely, no adult went with you. Afterward, your parents probably took some of your candy stash because they didn’t want you to go crazy and eat it all at once. But you did get to eat it, slowly, over the next week or two. Even though this was the bad old New York of the 1970s, no one was too worried about Halloween candy contaminated with poison or razor blades. If you were born too early or too late to experience Halloween 1970s style, you can get a sense of it through some wonderful photos taken that decade by street photographer Larry Racioppo. Racioppo’s Halloween images are available for viewing via the New York Public Library’s Digital Collection. A few examples are in this post. I’m not sure where we are in the city, though the photo at right shows a war memorial that appears to be put up by the 12th Street block association…though it’s hard to read. These black and whites capture a moment in time when many parts of New York were rundown and neglected. But that couldn’t stop kids from savoring the thrill of dressing up on Halloween. Racioppo’s work captures other scenes of New York, and he even put out a book of his Halloween photos in 1980, available on Amazon as well as through his own site. This entry was posted on October 15, 2018 at 5:54 am and is filed under Holiday traditions, Music, art, theater. You can follow any responses to this entry through the RSS 2.0 feed. You can leave a response, or trackback from your own site. I was there! And I saw those exact costumes! How fun!!! Larry Racioppo is Brooklyn born and raised. These look like Brooklyn to me, Esther. I believe you and the commenter below are correct. Too unpopulated even for 1970s 12th Street in Manhattan. Those costumes and masks in a box were made by the Ben Cooper Company. They were our Long Island neighbors growing up. Love the b/w photos. I’ll take the ” rundown and neglected” of 70’s over the gentrified yuppiedom of today. N.Y.C. went from funky to frou-frou. This is almost assuredly the Park Slope/Gowanus Heights section of Brooklyn. Not only does the look fit, but 12th and 21st streets are referenced in various photos, and those blocks transverse these neighborhoods. Having done all my trick or treating in the 60s and 70s, though in Pennsylvania, I can say that we were constantly warned about razor blades in apples and other such dangers… but this is quite accurate otherwise! You don’t mention trick or treating for UNICEF, with the little cardboard boxes on strings, but maybe that wasn’t done in New York. The photographs are wonderful. Unicef, yes, but I don’t remember carrying those around trick or treating in NYC. They did give them to us when I moved to Jersey though! I was, and it did. Everything in this post is spot on. 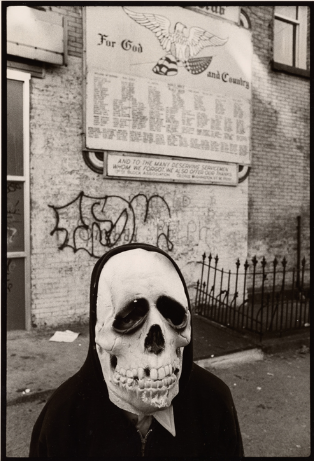 Halloween in the 1970’s was FRIGHTFUL and DANGEROUS on the Lower East Side where I grew up. It was a struggle to get home early enough to avoid the Mobs of marauding Puerto Rican kids where I grew up who would assault you with Socks filled with rocks and heavy pieces of Chalk called Mamaluchos. No I don’t remember this with a smile on my face. This was the NYC that keenanpatrick424 is pining for! These ‘creatures’ are coming back anyway. They feel very comfortable with this worthless Mayor. Amazing! Tom B is another mind reader like NYC4ME(see blog “a painter who said the subway was his art school”). I most certainly do not pine for violence by any one group against anyone. And I do remember when baseball bat wielding Italians rampaged thru Washington Square yelling, “All niggers out of the park”. And I remember when gangs of Irish punks in Chelsea beat up individual gay men.Presently,I would rather see a 4 legged rat than the 2 legged rat real estate developers and banksters who have ‘mallified’ N.Y.C. with ubiquitous chain stores replacing the unique ‘mom and pop’ stores. A note to Jim Carrol-We are all creatures but some of us evolved beyond the evil of racism. Sorry I dont look at the Wilding Miscreants as Human. I see them as two-legged Rats. I would much rather see the four-legged kind. The 4-legged kind are just trying to survive. Indeed racism is a disease.Hope you are cured for the sake of your own sanity. Yes I am good. I hope you open your eyes on Halloween when the two-legged Rats come bearing down on you. Hint: Remind them that you are NOT a Racist…You will be one of the BIGGEST after they are done with you. I grew up trick or treating in the 60s and 70s and though I lived in the south, it was much like this. I remember those plastic masks with the rubber band and how just after you wore them a few minutes, the condensation would be dripping from upper lip and face! We used to always hear stories about razor blade candy or apples. Halloween was very big in our neighborhood and very fun!!! Enjoyed your post!